Sometimes a picture or a video can communicate much more than words and this 55-second Youtube post (see https://youtu.be/IOERJ0fdUb4), is a great example. 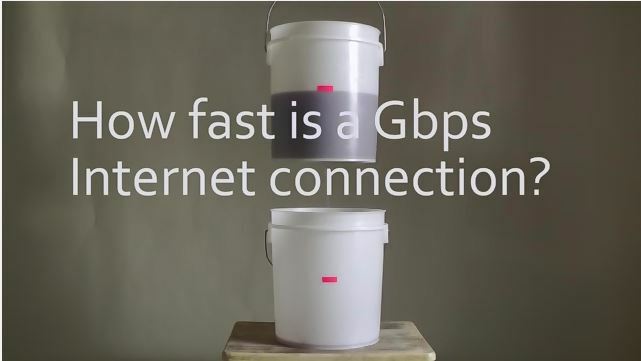 It basically uses a couple of plastic buckets, one of which has a hole in the bottom, to illustrate just how much of a difference gigabit broadband really does make. Just watch it. You will see what we mean. It’s also great for showing just how slow anything under about 15Mbps is these days. While that would have been regarded as quite fast just a few months ago, with the roll-out of fibre-based services across the UK, expectations have risen. Uptake of cloud services is sky-rocketing and with it, so is the demand for bandwidth. The amount of data being stored by businesses is going through the roof. Running a full backup of say 500GB of data to a cloud service, could take many, many hours over a 15Mbps connection, depending on how consistent the speed you get is during the backup. And, as we all know, the speed is always going to vary unless you have a leased line. In the consumer market, the growth of streaming and higher-quality video technology and gaming is sending bandwidth demand through the roof. Some of the biggest games are now in excess of 50GB in size, and that will take hours to download over a standard home broadband connection. While most home users and businesses might not need the extra bandwidth that super-fast broadband will offer them today, they will need it soon and they won’t want to find themselves in the position of sitting there waiting for the download or upload to finish and then scrabbling around to get a faster connection as soon as they can. Upgrading is simple enough sometimes, but it can take days or even weeks. Our advice is to show them this video and persuade them to upgrade to super-fast services that are now being rolled out across the UK as soon as possible – before they find themselves in real need of the extra speed. We’ll be happy to talk to you about the different options in your area and set-up and / or run speed tests for specific customers.